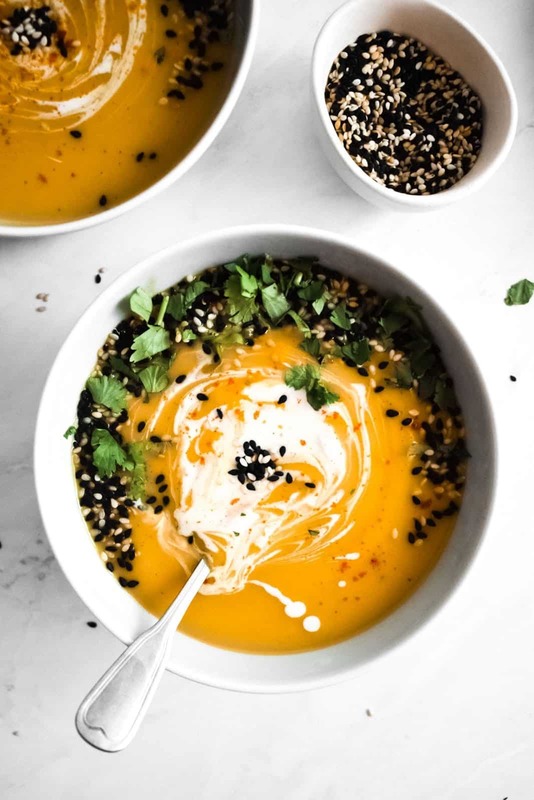 This easy butternut squash & coconut soup is packed with nutrients. It’s gorgeously creamy and comforting to warm you up on a cold winter afternoon. Made in under an hour, it’s perfect for all you busy bees! Ok, I’ll admit it. It was about time to break away from the dessert overload happening on My Vegan Minimalist lately. 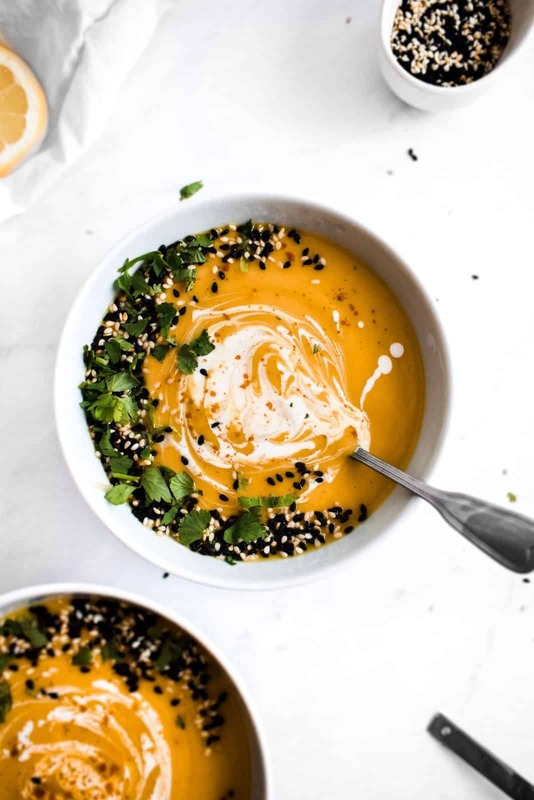 This gorgeous butternut squash & coconut soup is my answer. I’ve always been a fan of creamy vegan soups. They’re one of the easiest things you can make, and yet they’re filled to the brim with flavour. This is a real feel-good soup. The vibrant orange tones are like sunshine in a bowl, while the coriander packs a burst of freshness. Smelling this curried butter squash soup across the kitchen on a cold winter evening is like seeing the light at the end of the tunnel. We’ve had a particularly miserable winter here in the UK this year, with constant greyness and relentless rain. I always believed that food has a potentially ecstatic quality about it. It somehow manages to turn around even the most miserable days and transforms mediocre occasions into unforgettable memories. 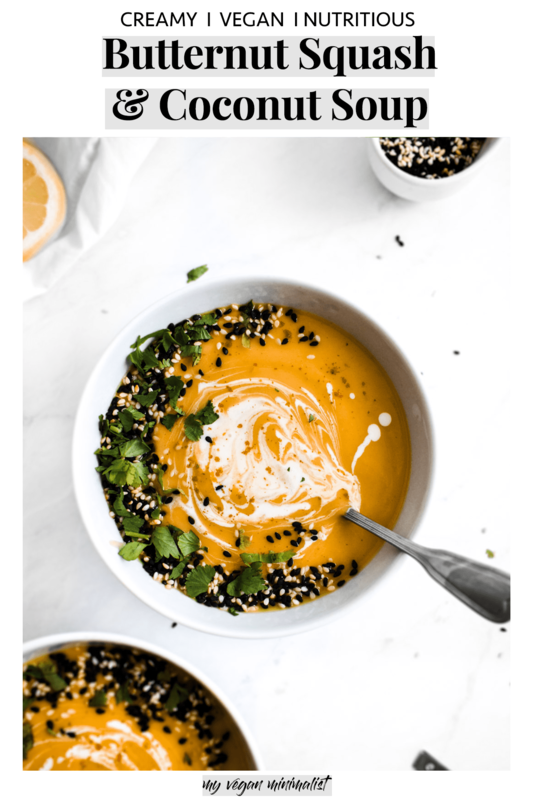 Likewise, this creamy vegan soup is a ray of sunshine that will put a smile on your face when you need it most. What makes it even better is how affordable it is. I love adding butternut squash to just about anything. It’s great in risotto, makes the perfect mash potato substitute and guarantees a rich and creamy pasta sauce. The great thing about using it in soups is the short cook time. Much like tofu, it can easily absorb and enhance other flavours. This is why adding coconut and rich curry spice mix works so well! Ending food waste with making even larger meals? Is that not a bit of a contradiction? The crucial element here is, of course, freezing. And who wouldn’t want that? 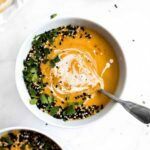 Creamy soups like my vegan butternut squash soup are ideal for freezing. Now make sure to get some BPA free containers and get freezing! Lightly fry your onion and garlic on medium heat for 5-10 minutes. Add diced butternut squash and plenty of seasoning – add 3 teaspoons of curry seasoning and a few pinches of turmeric, onion powder and salt. Add vegetable stock (1L) and continue to simmer for 20 minutes. Blend your soup to achieve perfect creamy consistency. Top off with chopped coriander and toasted sesame seeds before serving.